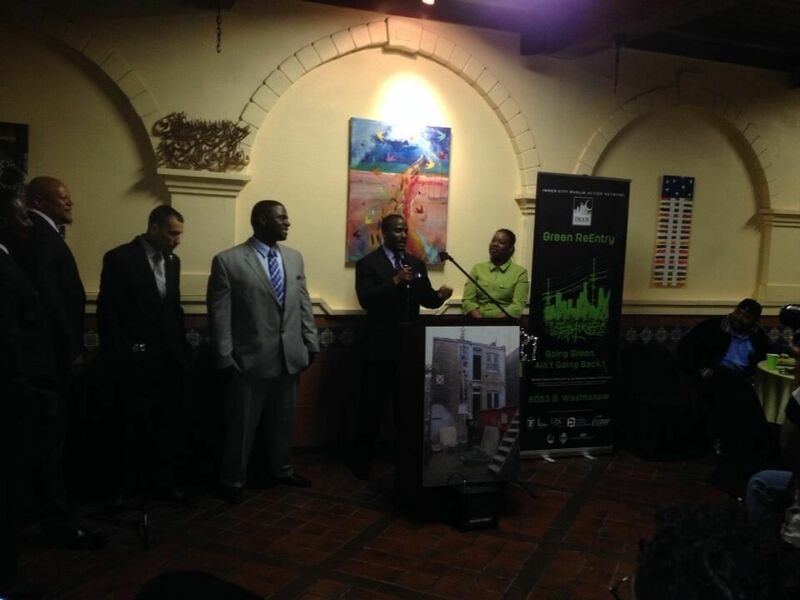 The seven month training and development program for this year’s Green ReEntry cohort came to a successful close on Wednesday, May 14, when all five members of the group joined together one last time, dressed to the nines in their new suits and with family, to celebrate their accomplishments. “The moment really exceeded my expectations,” said Levie Ibrahim Jackson who was the team leader of the Green ReEntry crew and who joined the program only months after his release from a 13-year prison sentence. Ibrahim attended the graduation with his mother. “It made her proud to see what I accomplished,” he said. Others from the crew brought sisters, brothers, parents and other extended family and friends to IMAN’s Youth and Arts Wellness Center for the event. Each brother received a certification of completion from the program and another key training certification such as OSHA. They all reflected publicly upon their time in the program as more than just a “job-training” program. “This gave me my humanity back,” said Charles Yacoub Farmer who also joined the program only a few months back from a long prison sentence. In addition to learning how to green retrofit homes, the Green ReEntry crew had a weekly course where they learned a host of critical “soft skills” and worked with Dr. Rolanda West to deepen their understanding and comfort with research, public speaking and team building. “This was an amazing crew of brothers, and they had a deep impact on the community over this last seven months,” said Rami Nashashibi, IMAN’s Executive Director. “We are eager to continue to grow and to take this initiative to scale so we can see it happening all-year and with larger groups of the formerly-incarcerated.” Leaders like Ibrahim impressed the partnering general contractor so much that they decided to hire him for their next work project. Meanwhile, IMAN is still looking to help place the other crew members in stable positions that will allow them to use the skills they learned during the Green ReEntry initiative. This entry was posted in Direct Services, News, Organizing & Advocacy by IMAN Staff. Bookmark the permalink.